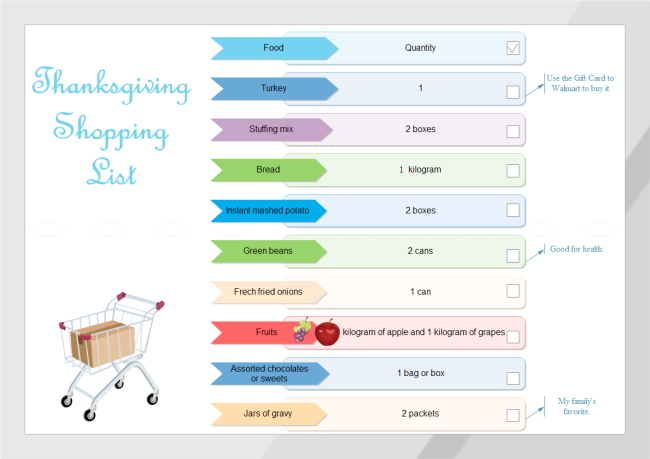 Get free, editable and printable shopping list templates here. Learn how to make it easily on your own in less than 10 minutes. If you use a template to make a shopping list, you can gain better results in less time. Experience it by following the steps below. Click the above picture to download the template. Replace the text with your own contents. 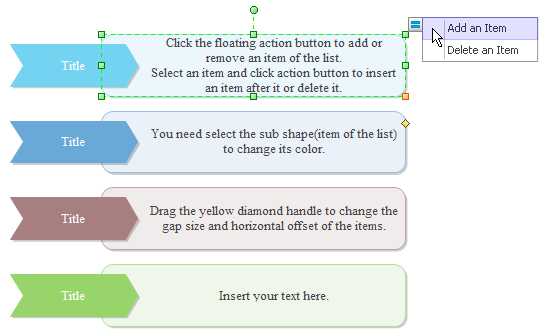 Use the floating action button of list shape to add/delete an item. Click the floating action button of checkbox to choose Selected. If you don't like this template, there are more styles for your options. Refer to the picture below. 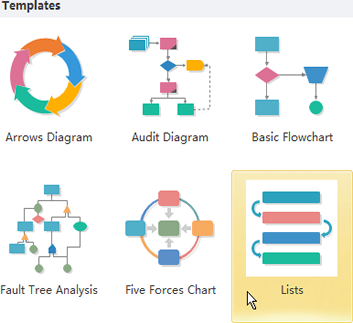 To learn more about these templates, read this article: List Diagram Shapes - Create Block List, Process List Easily. If you want to experience the drawing process, see the following guide. To begin with, open Edraw and the libraries needed. We need List, Callout, Fruit and Backgrounds to draw the above shopping list. Follow these steps: Start Edraw. 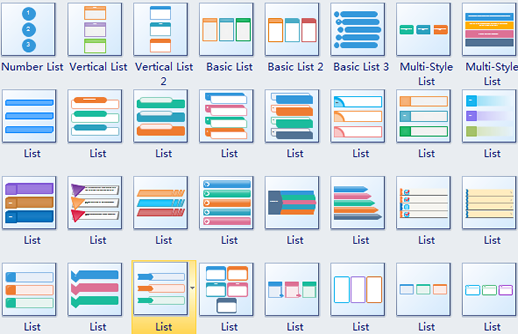 -> Double click Lists in the Template window. -> The list libraries open on the left side of the window. 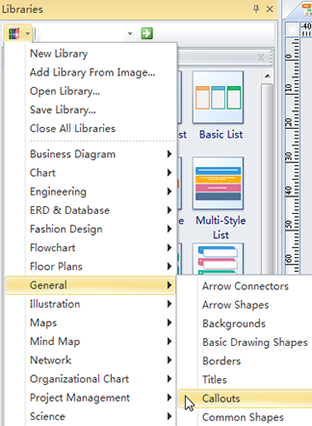 Click List Shape title and drag your preferable shape onto the canvas. To open other libraries: Click Libraries button and scroll down to choose General type -> Select Callouts. -> Open other libraries similarly. -> Drag all neccesary shapes into the diagram. Secondly, adjust the shapes. Rest the pointer over the shape. -> Point towards the floating button. -> Click Add an Item until there are enough items. 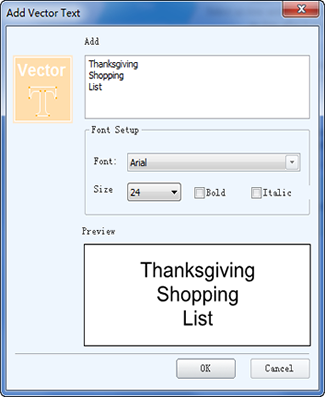 Double click the text box to add food name and quantity each text box. -> Format the text. Then uncheck the checkbox. Rest the cursor over the checkbox. -> Click the menu of floating button. Last but not least, design a catchy headline. Click Insert menu. -> Use Vector Text function. -> Type in the title. Here you go. You can have a useful shopping list quite easily and quickly. Print it and it becomes portable. When shopping, check the item you have bought in the checkbox. You can make modification to it again and again for future use. You will embrace enormous possibilities as long as you try.